Have a hankering to pound a gavel on a bench? To slide your bottom across old wood pews made glossy with decades of use? To huddle in your own private holding cell? Or just to own a former federal courthouse? Now’s your chance. The GSA is selling the 221,000 square foot building in Billings, Montana to the highest bidder. 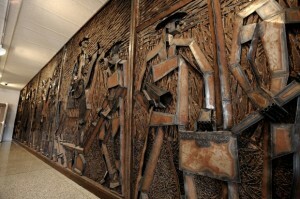 It even comes with a sculpted metal wall mural of Montanans at work. (And with a ton of asbestos, although if the buyer doesn’t alter the building much, removal is apparently not required.) More specs and photos from the Billings Gazette. And no, I have no idea how you might use this in your fiction — but I thought you’d want to know anyway! This entry was posted in Uncategorized and tagged Bilings, federal courthouse, Lyndon Pomeroy by Leslie Budewitz. Bookmark the permalink. Neat! C’mon, Billings! a couple of small theater groups could perform in courtrooms Use jail cells for retail stores. Hallways would make great galleries for art of all kinds.I bet some of the rooms could be turned into artstudio spaces as well. Maybe rent cells to writers? Ooh! Good ideas! The original county jail — a sandstone building from the 1880s — was turned into the Yellowstone Art Center decades ago. Loved going there as a kid — the old cells were small galleries and we were told that a hole in the ceiling was for the hanging rope. Was it really? Who knows! I like the theater suggestion. If the audience didn’t like the show, then they could drag players to the cells. Haunted with the ghosts of criminal defendants? I love the Classic Architecture of many old courthouses. Brings the gravitas of the law right down on your head, I think. This one’s not all that old or historic, but haunted? Great idea! Years ago, when I was living in Wooster, Ohio, the old county jail was converted into a restaurant, with jail-related names for some of the menu items. We went there once–the food was fine, but I’ll admit I felt uncomfortable eating in a place where so many people had been frightened and miserable. Maybe a courthouse restaurant would feel less poignant. Ah, feng shui — the feeling or movement of energy in a space. It can be tangible, can’t it? There is a “gallows humor” with most of us in the Criminal Law game and we would not be as repelled by the jailhouse restaurant! Perhaps Famous Criminal names on the burgers would be funnier than jail -related, and I’m hoping it was more that “bread and water”! Courthouse Restaurant would feel more like a workplace cafeteria to us, though! But I agree, B.K., eating in jail doesn’t sound all that fun! If someone had the money to have the asbestos removed before all the ideas above I bet it’d be something to bring in more tourists lol. Asbestos can be removed or contained, so it might not be a problem for a developer. 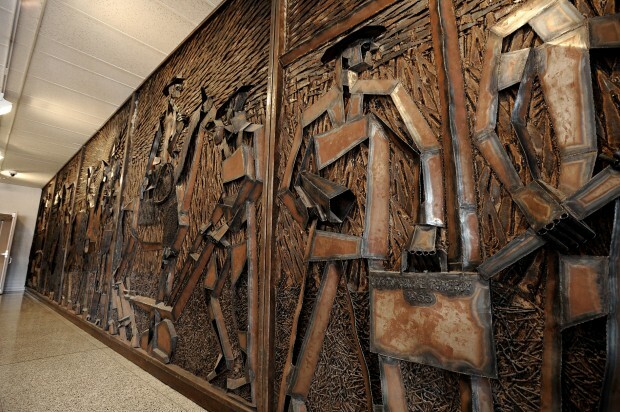 I always loved that metal mural. I’ll keep you posted!